My cheapest find of all -From Wanstead Rugby Club Boot Sale, a Gucci Accessory Collection Satin Purse for 20p !!! PLUS £100!!! Yes-£100 found in a secret compartment!! Oh yes-I did not find this until about a week later, when I gave the purse a once over-I was totally gobsmacked when one of the compartments revealed a money bag which had 5 old £20 notes in it!! The bank changed them for modern ones, but this has got to be the ultimate buy so far! The Gucci purse is the best vintage buy I've ever heard of. the electric blue purse is such a find!!!! Hi Ida-thanks so much-thats really nice of you-I will definitely think of you first if this bag leaves my wardrobe!! 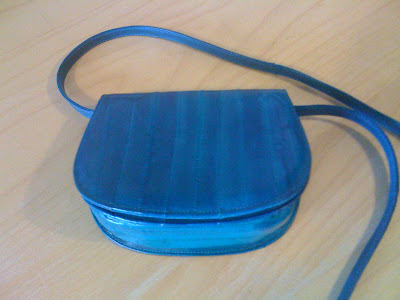 Hi studentsil-thanks very much-yes, I do love the blue purse-the colour is very vivid! Hi Wendy-thanks so much-yes, I've got to beat this-I have to find an Ossie dirt cheap-I wish!! Thanks catherine ashley-yes, it is really cute!! You're such a crazy shopper! I love the blue bag. Hi Charlotte-thanks!! I think I am crazy where shoppings concerned-I buy too much!! Hi rose!! I'm sure you also have some things I would be jealous of-ha ha!! Wow! great finds! would love a missoni scarf. I can't believe the prices on all these things! Thanks pamcasso! Yes, this is something I've always wanted too, so I was very pleased when the cashier said she only wanted £2-result!! I dont understand how you can get all these pieces so cheap! That never happens here, haha. Hi Silje-I don't always find things when I go thrifting-believe it or not I sometimes come home empty handed! I suppose its more at boot sales that I get my bargains, especially in the 'posher parts of Essex'-ha ha! !